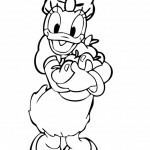 Welcome to our Daisy Duck coloring pages! 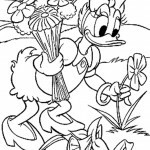 On this page you can find some very nice Daisy Duck coloring pages which you can color as you’d like, but you can also find some very interesting information about Daisy Duck. 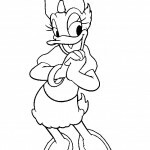 The history of Daisy in animation can be traced to the appearance of her precursor Donna Duck in the cartoon short Don Donald (first released on January 9, 1937). The short was directed by Ben Sharpsteen. 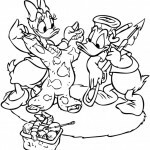 The plot had Donald courting Donna somewhere in Mexico or Spain. 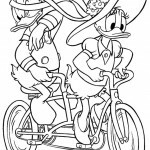 His efforts were frustrated and Donald leaves him alone and rides away in her unicycle by the finale. 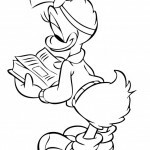 The short is important for introducing a romantic interest for Donald. 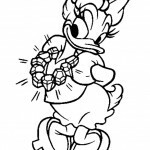 But one should note that Donna had little in common with Daisy other than both being female ducks and sharing a temper. 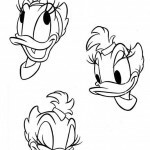 Donna was more or less a female version of Donald both in design and voice. 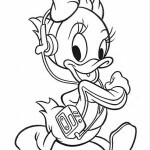 Her voice was provided by Clarence Nash and was a slightly higher pitched version of that of Donald. 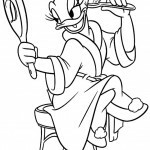 Donna was not intended as a recurring character and the Donald shorts of the following three years featured no female companion for him. 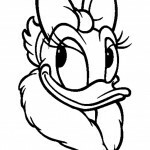 Daisy Duck in her familiar name and design first appeared in Mr. 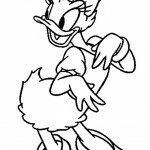 Duck Steps Out (June 7, 1940). 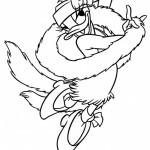 The short was directed by Jack King and scripted by Carl Barks. 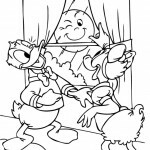 There Donald visits the house of his new romantic interest for their first known date . 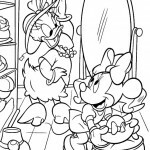 At first Daisy acts shy and has her back turned to her visitor. 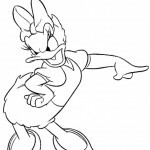 But Donald soon notices her tailfeathers taking the form of a hand and signaling for him to come closer. 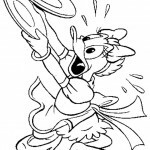 But their time alone is soon interrupted by Huey, Dewey, and Louie who have followed their uncle and clearly compete with him for the attention of Daisy. Uncle and nephews take turns dancing the jitterbug with her while trying to get rid of each other. In their final effort the three younger Ducks feed their uncle maize (corn) in the process of becoming popcorn. 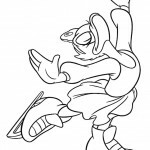 The process is completed within Donald himself who continues to move spastically around the house while maintaining the appearance of dancing. 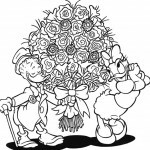 The short ends with an impressed Daisy showering her new boyfriend with kisses. 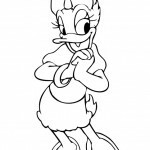 Like her precursor, she was initially voiced by Clarence Nash, but would later have a more lady-like voice. 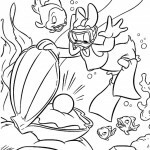 The short stands out among other Donald shorts of the period for its use of modern music and surreal situations throughout. 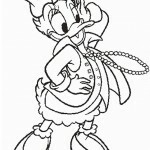 The idea of a permanent love interest of Donald was well established following it. 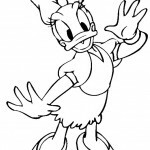 But Daisy did not appear as regularly as Donald himself. 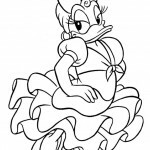 Her next appearance in A Good Time for a Dime (May 9, 1941) features her as one of the temptations threatening to separate Donald from his money. 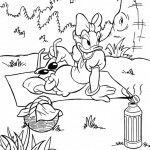 Now that you’re done reading, you’d better move on to our Daisy Duck coloring pages quickly!